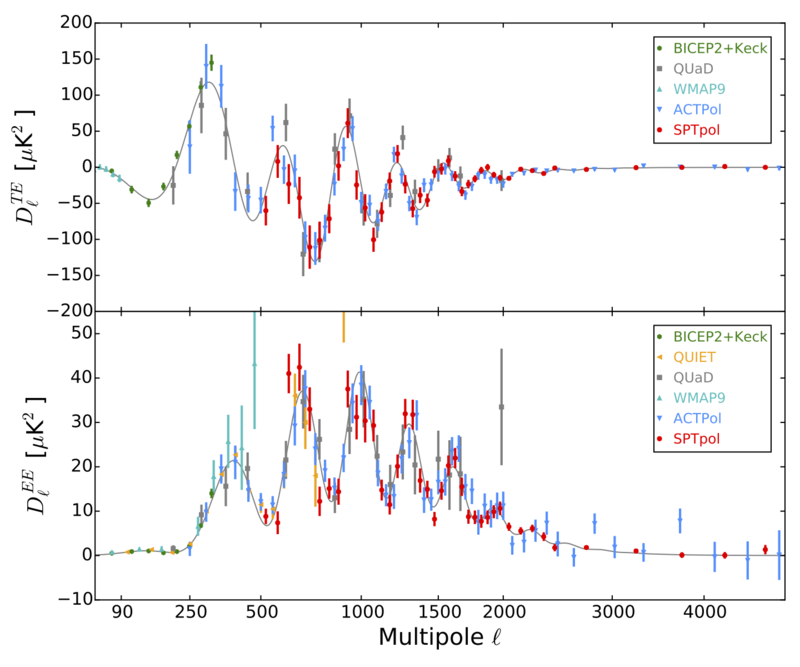 This page provides data products associated with the SPTpol measurement of the CMB EE and TE polarization power spectra described in astro-ph/1411.1042, Crites et al., 2014. 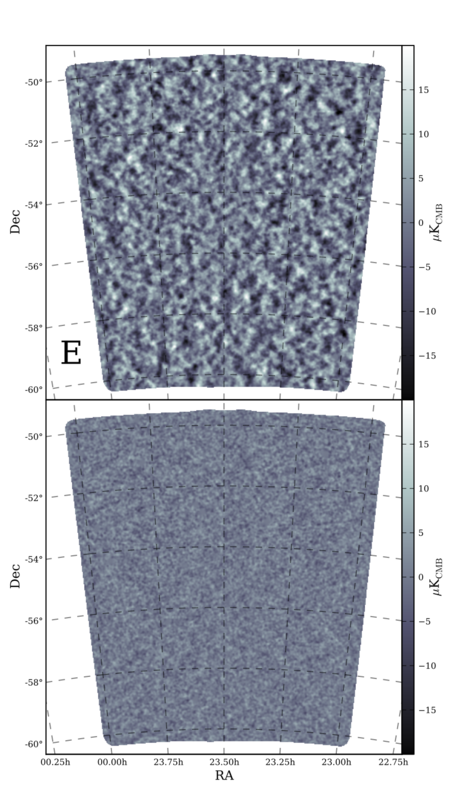 The power spectra are presented over the multipole range 500 < ell <= 5000 and can be used to constrain cosmological models using the likelihood package provided below. If you have any questions regarding this data set or its use, please contact Abigail Crites (acrites_at_caltech_dot_edu) or Jason Henning (jhenning_at_kicp_dot_uchicago_dot_edu). We provide the SPTpol 150 GHz EE and TE Bandpowers from 2012 observations. The bandpowers cover the multipole range 500 < ell <= 5000 in bins of delta-ell = 50 between 501 < ell < 2000, delta_ell = 100 from 2001 < ell <= 2500, and delta_ell = 500 from 2501 < ell <= 5000. Bandcenters, bandpowers, and bandpower errors for plotting are provided in a text file here. Each row is one ell-bin. The columns are (1) ell_min, (2) ell_max, (3) ell_center, (4) bandpower for 150x150 in D_ell units of uK^2, and (5) bandpower uncertainty for 150x150 in D_ell units of uK^2. An alternative form of the bandpowers for plotting with calibration and beam errors included in the uncertainties are provided in a text file here. Note that these bandpowers include power from foregrounds, such as point sources, though we do not significantly detect this power. Nevertheless, a Poisson foreground term is included in our likelihood model, the amplitude of which is required to be positive by default but may be adjusted by editing the accompanying SPTpol batch file provided in the likelihood package below. We provide files in a gzipped tarball here that can be added to the Oct13 version of CosmoMC to interface with the SPTpol EE and TE bandpowers discussed above. These files include the SPTpol likelihood, SPTpol data (bandpowers, covariance matrix, and bandpower window functions), batch file, an example runscript, and a README with instructions for how to modify a Makefile to compile CosmoMC with the SPTpol likelihood.